The Word of God 1: The Bible or Spirit Communication? The Cessation of Communication with God's Spirits in Christianity: When? Why? and How? The Question "Why is Jesus the Only Way to the Father?" What Is Meant by "the Spirit World"? What is Meant by Odic Energy? What Does "Satan Masquerades as an Angel of Light" Imply? Speaking in Tongues: What Is It? What is the True Denomination? For Johannes Greber, Communication with the Spirit World of God: Its Laws and Purpose (6th edition) go to: www.godsgrandplan.org/page2. For Johannes Greber, Communication with the Spirit World of God: Its Laws and Purpose, trans. Elsa Lattey and Josef Greber go to: http://www.tiptopwebsite.com/files/xellers12.pdf?733. Communication with the spirit world has always existed with mankind. Today communication with spirits is given the name "spiritism," a term, arguably, coined by Allan Kardec (a pseudonym given to the French educator Hippolyte Leon Denizard Rivail, 1804-1869) who is considered one of the earliest proponents of spiritism in the modern era. The term "spiritualism" is sometimes used interchangeably with "spiritism," but since "spiritualism" was first used for a philosophical movement in contrast to materialism, the term "spiritism" is the more favored term since the objects of communication are the spirits themselves (spirit-ism). The term "spiritual" can, indeed, refer to "that which pertains to spirits." The term "spiritism" is often used for any New Age theology (especially anything having to do with "channeling"), and a myriad of other schools of occult or psychic thought, most notably Theosophy. Names such as Helena Petrova Blavatsky, Rudolph Steiner, and Edgar Cayce are sometimes associated with the term "spiritism"; an association that is rather sloppy, for in the case of Blavatsky communication with spirits is frowned upon. Spiritism then becomes a catch-all word for the New Age and is understood by many Christians to be antithetical to Christianity. This website, however, shows that the antithesis is not between spiritism and Christianity but rather between the holy spirit world of God and the evil spirit world of Lucifer, an ages-old division that was sometimes expressed in antiquity as a division between the "sons of light" and the "sons of darkness." From its beginning, Christianity has found itself between these two realms, but always encouraged to choose the path of the holy spirits. Both realms are "spirit" sources. God is a Spirit (Isaiah 31:3; John 4:24). Christ is a spirit (1 Corinthians 15:45). The angels are spirits (Hebrews 1:14). The demons are spirits (Matthew 8:16; 12:45; 1 Corinthians 10:20,21). And Satan is a spirit (1 Corinthians 2:12). So, then, no specific spirit is intended by the term "spiritism" (despite pop-culture's use of the term for only spirits of the dearly departed). Instead, the existence of spirits is the basis for the term and covers the whole range of the multi-dimensional spirit realms, be they good or bad; be they of God or Lucifer. Obviously, discernment becomes a top priority. But there is one obscure name that is identified with a much higher form and more pure brand of spiritism than what is often found in the likes of many run-of-the-mill spiritists. That name is Johannes Greber. The life of Johannes Greber is a fascinating one; a life that could only have been guided by holy spirits sent by God on behalf of Christ. A word before we proceed. Who am I? Why am I here? Is there an afterlife? If so, then what is it like? That said, let's look at a brief history of the trailblazer, Johannes Greber. Johannes Greber was born in Wenigerath, Germany, on May 2, 1874 and died in New York on March 31, 1944. 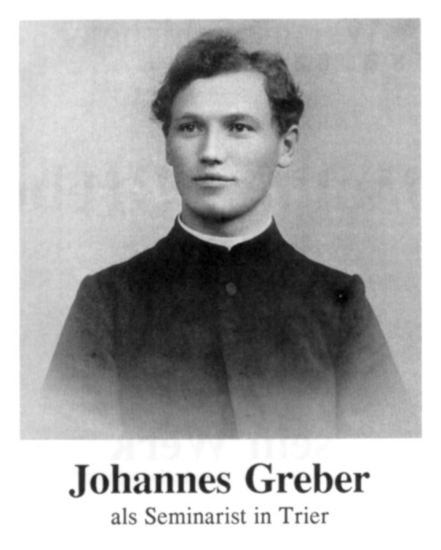 Greber studied for the Priesthood in a Seminary in Trier, Germany, and was ordained a Roman Catholic Priest in 1900. The picture to the left is from this period. Shortly after his ordination, Greber was instrumental in providing help to the poor and to the sick in the Hunsrueck, a rural, mountainous section with poor soil and whose inhabitants were mostly small farmers. Greber became aware of their hardships with disease, primarily tuberculosis, and arranged for the training of young, qualified women to become nurses at the nearest hospitals. Greber possessed a knowledge of natural healing methods and used herbs and natural remedies to cure the diseased. In a period of a few short years, tuberculosis was nearly eradicated among the inhabitants of the Hunsrueck. During World War 1, Greber felt the need to transport those of the Hunsrueck, who were starving from lack of food, to Holland where there was an abundance of food. After much prayer, without the help of the Church and State, who felt his plan could not work, Greber transported children in groups of 75-100 to Holland. Greber selected the neediest children first, regardless of their religious background. He was able to transport more than 14,000 children from his area, the Hunsrueck, to Holland. At times, when money was short, Greber financed the transport with his personal income. He founded a self-help organization, Hilfsbund, that contintued to provide help to the poor and sick after the war in 1918. In 1918, Greber, with God's help, was able to protect his village from marauding looters (so-called "political prisoners" who had been released from jail after Wolrd War I. In one instance, he was inspired to direct members of his parish to fend off these looters who would go into small villages and steal food and wares from individual houses. Greber met with the men of one village and advised them how to fend off the looters. Pastor Greber, inspired by God's spirits, advised the men that when they become aware that the looters are approaching town, someone must run to the post office and telephone the next town that the looters are coming. Then, that town should telephone the next town, and the next town, and the next town, so that all of the villagers in every town are prepared for the coming of the looters. Then, he told the men in the village to grab axes and hoes and stand on street corners and look the looters in their eyes with a determined look. The looters arrived but were intimidated by the stand the villagers were taking against them; non-violent, yet very effective and decisive. The looters veered off into the next town and encountered the same thing: villagers there were just as prepared with axes and hoes standing on street corners. Town after town, the same thing. So the looters tried again the following week but to no avail; the villagers were once again successful. The looters convened a meeting to put an end to this intimidation and decided that Pastor Greber was behind it. So, the looters decided that Pastor Greber should be killed as soon as possible. One day, Pastor Greber was to go to a neighboring town on foot (this was before the car). He walked through the fields towards the woods and he looked around and saw somebody was running after him. This somebody finally caught up with him. The first thing he said to Greber was, "Now we are going to finish you. You're the one behind this here game you are playing. We are going to finish you! You are not going to do this any longer! This is the end of you!" The man, standing about four feet away from Pastor Greber, took his army rifle and pointed it at Pastor Greber's face. Greber was inspired and stood there, still, and looked at the criminal very sternly, fearless and determined with a look that the man had never seen before in a victim. This perplexed the would-be murderer, who went ahead and pulled the trigger of his army rifle: click, click, click. Nothing happened; no bullets were discharged. The criminal was bewildered, he didn't know what to say. He looked at Greber. Greber stood there staring him down, determined and fearless. The criminal, perplexed and a little frightened, dropped his gun and ran away. Pastor Greber picked up the gun and pulled the trigger: bang! bang! bang! There was nothing wrong with the gun. God's spirits had spared Pastor Greber's life whose work had yet to be fulfilled. For Pastor Greber was not like any incarnation: he came to this earth on a mission for his fellow Man, and no impish criminal was going to stop him. 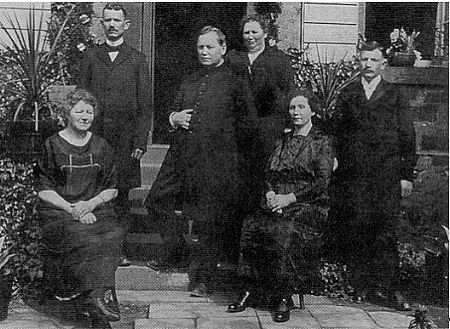 The picture to the left is of Johannes Greber (standing in the middle with right hand in his coat) surrounded by his siblings during Greber's silver anniversary celebration as a Roman Catholic Priest in Kell in 1925. Late in the summer of 1923, Greber was visited by a parishoner who urged Greber to attend a prayer meeting that the parishoner was in the habit of attending. A prayer meeting--sounds appropriate for a Catholic priest to be a part of. The parishoner, however, described what went on during the prayer meetings: a young farm boy with an elementary school education would often lapse into a state of trance to make way for a spirit to enter into him. The spirit would then make use of the farm boy's organs for speech and "impart wonerful tidings to it's hearers." The messages exceeded far above and beyond that of the intellectual capacity of the boy as well as the knowledge of the others who were present for the prayer meeting. Initially, Greber would have nothing of it. He dismissed such things as quackery and charlatanism from what he had read of it in the newspapers. Greber was also concerned with his position in the community. A Catholic priest who attends sittings for communicating with spirits, popularly known as seances, might run the risk of making himself look ridiculous. The parishoner kept urging Pastor Greber to at least sit in and observe, ask questions in order to ascertain the veracity of the proceedings. Greber relented, but only at the last moment while still remaining skeptical. 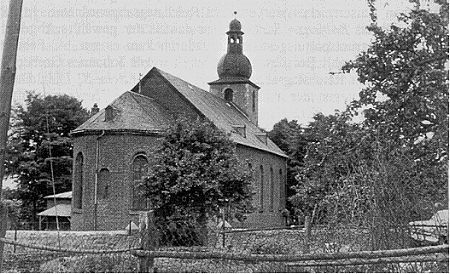 The picture below is Greber's parish in Kell, Germany, as it looked during his work there. What Greber expected to expose as a piece of charlantry and fraud turned out to be an encounter with one of God's high spirit messengers. The spirit's words left Greber speechless and awed. This was no kind of conversation one has with a little farm boy--it certainly wasn't the farm boy speaking from himself, whom Greber had become acquainted with before the meeting took place: this speech is coming from that farm boy's head? Impossible. The episode left an indelible impression on the otherwise very skeptical, very cautious, and very Roman Catholic Johannes Greber. After continued attendance for the next two and a half years, Greber was given permanent leave from the Catholic Church to tend full time to his self-help organization. God had given him a harmonious leave for a higher direction; (he was never excommunicated). In 1929, Greber emigrated to the United States where he started a number of prayer groups in and around New York city. He eventually settled in Teaneck, New Jersey, where he conducted prayer meetings and began a church, accompanied by many healings of attendees that occurred through his agency as a manifestation of the holy spirit world through him. If the number of people healed were accounted for, it would fill a book. He began work on a book that chronicled his initial experience and decision to proceed with spirit communication: Der Verkehr mit der Geisterwelt (New York, NY: Macoy, 1932). An English translation was also published in 1932, Communication with the Spirit World Of God: Its Laws and Purpose. Personal Experiences of a Catholic Priest. 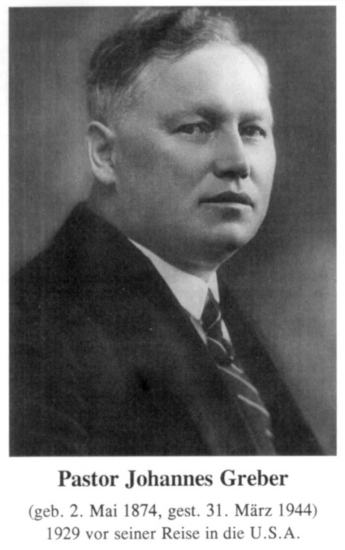 The English translation was prepared by George Knoblach. 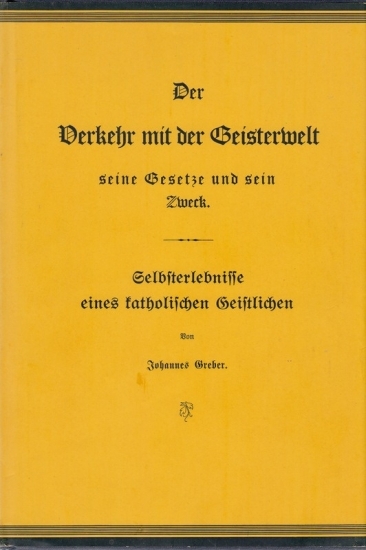 The German second edition of Greber's book has since been given a new and fresh English translation by Johannes Greber's son, Josef Greber along with Elsa Lattey. It became available in 2007 and is appended to this page as a pdf. For the world lies in darkness, and its inhabitants are without light. For your Law has been burned (recall Jeremiah 36:23), and so no one knows the things which have been done or will be done by you. If then I have found favor before you, send a holy spirit to me (inmette in me spiritum sanctum), and I will write everything that has happened in the world from the beginning, the things which were written in your Law, that people may be able to find the path, and that those who wish to live in the last days may live (vv. 21–22). Books and manuscripts that record "God's word" are transient and susceptible to human corruption (see Jeremiah 8:8) and physical destruction, in this case, fire. But God will communicate his word anew; He will "send a holy spirit" whenever necessary. Such is the attitude taken by Greber in his Introduction, and such is proclaimed in both the Old and New Testaments. At the age of 57, Johannes Greber married Elizabeth, who had earlier (at the age of 15) blurtted out that she was to marry Pastor Greber while living in Germany. This shocked her very Catholic mother: Priests can't get married! How dare you! The holy spirits had organized this marriage apparently at both Johannes' and Elizabeth's birth: it was meant to be. Elizabeth bore him two sons, Emanuel ("Manny") and Joseph. 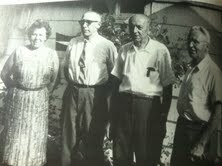 In this photo is Elizabeth and her two sons, Joseph who is to her left, and Manny who is to her right. Below the photo of Elizabeth Greber and her two sons is a photo of Joseph and Manny taken while they were young children in children's sailor suits: Emanuel Greber b. June 5, 1933, is to the right, and Joseph Greber, b. November 15, 1934, is to the left. Both sons witnessed the manifestations of good spirits during the prayer meetings of their father and mother. Joseph's personal testimony as recorded on video tape by Dr. Tony Scarborough (September 29, 1991, in Colorado) presents his account of witnessing the full materialization of a female North American Indian spirit named "Silver Leaf." Pastor Greber spoke to Silver Leaf first and then the fully materialized spirit asked to see his children. She came to both Emanuel and Joseph and draped her two, very long braided pony tails around each child's shoulder. Joseph, then age 9, described her as every bit a human being as one of the sitters present. The only difference was that Silver Leaf felt cold to the touch; as if she had just come indoors from 45 degree cool weather. The Indian spirit Silver Leaf was not a holy spirit from the higher heavens, but rather a kindly spirit well disposed toward children. Silver Leaf may not have been able to communicate the type of Salvific messages that comes from spirits who originate in the higher Heavens, but her appearance certainly provided empirical evidence for the existence of spirits who reside in another dimension and a demonstration of how spirits can manifest in our physical dimension. Silver Leaf made spirit "small talk" as Joseph described it. She may have been a mundane spirit, but a kindly one nevertheless. The point of holding prayer seances, however, is to draw the participant closer to God. The expectation of "spiritistic spectacles" at such prayer meetings should be avoided, for such expectation is not the point for these meetings. If one's only interest in participating in spiritistic services is to seek proof for the existence of a spirit world, e.g. to witness a materialization, then one has mistaken the purpose for such services. That purpose is: pray to God, ask for Him to Send His holy ones from on High so that they might share messages that teach the way to God and character development. If a materialization is to occur, that alone is up to God. If a holy spirit is to manifest through a deep-trance medium, that alone is up to God. I am reminded of an incident of a prayer circle that was told by its communicating spirit through its deep-trance medium that a materilazation was to occur on a particular date. On the night of the expected materialization, there were others present with video cameras and recording devices ready to capture this materialization on video and film. Expectations were high that evening, and some were "giddy" at the prospect of witnessing the full bodily materialization of a spirit for themselves and recording it as well for prosterity. The prayer meeting opened as usual, and the communicating spirit opened with his usual greetings from on High, and then addressed those present in the following manner: "Have you come to praise God or study phenomena?" It was as if the spirit was reprimanding those who were solely interested in proof of spirits. It is true that we all would love more evidence for the existence of spirits. Myself included. But, this particular episode teaches us a very important point: Pray seances are more Godly than people realize, and so such services should be carried out with the utmost devotion to God, and NOT to phenomena or seeking proof of the existence of dead relatives and friends who have passed over into the Beyond. Joseph Greber died in 2007. Emanuel (at this writing, August 15, 2008) is still living. The materialization of Silver Leaf served to prove that there was a spirit world and moved several attendess profoundly. The annals of spiritist and psychical literature from the 1930s till the 1980s are quite awesome in quantity. They are rife with the names of experimenters, scientists, mediums, and the skeptics. 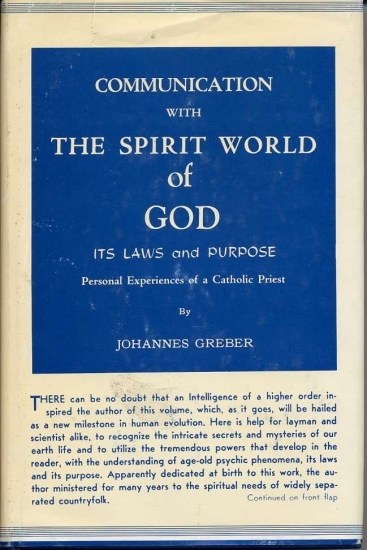 But one will search in vain to find the name "Johannes Greber" despite his contribution to the field in understanding the laws and purpose of communicating with holy spirits; a contribution that no one has yet to supersede for its clarity, consistency, and significance. Greber's house in Teaneck, New Jersey, is seen here to the left. The person in this photo is unidentified. This house was the location of the Johannes Greber Memorial Foundation which Fred Haffner (see his photo below) faithfully managed and ran for many years. The impact of Greber's work has largely gone unnoticed by the marjority of researches in the field of spirit communication and psychical research. Maybe the reason for this is because Greber's work is too religious for the psychics and too spiritistic for the religious, and is not objective enough in the minds of the scientists who want to remain aloof of religious language, God talk, and Christianity. Whatever the case may be, Greber's work has not gone unnoticed by many serious-minded persons who have become convinced by this work that God does communicate today through His holy spirits as He did in the days of the ancient Israelites and the earliest Christians. Over the years Greber's book has sold over a quarter of a million copies, in three languages (English, French and German). 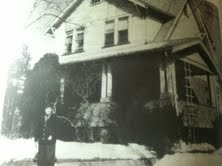 To the left is an informal photograph of Johannes Greber posing outside of his house in Teaneck, New Jersey, date unspecified. 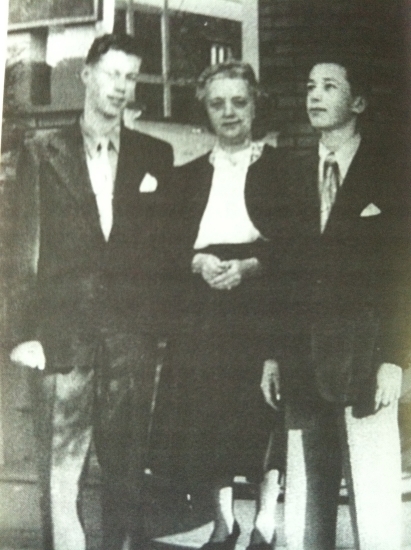 The photopgraph to the right shows Fred Haffner who was Elizabeth Greber's friend and who also managed the Johannes Greber Memorial Foundation from the 1950s through the 1980s. This photo is dated June 20, 1965. According to his own taped testimony, Haffner missed meeting Pastor Greber by a meer week. Haffner is seen wearing glasses and a tie; to the right of Haffner is Frieda Ulm; to Haffner's immediate left is Edward Niemann; and to Niemann's left is Hermann Ulm. Edward Niemann is the deep-trance medium that Greber was guided to seek out, as he describes in his book, Communication with the Spirit World of God. Edward Niemann was the medium through whom a holy spirit announced to both Johannes and Elizabeth during a prayer meeting that they were to be married. The holy spirit speaking through Niemann actually performed a "ceremony": Elizabeth, this is to be your husband; Johannes, this is to be your wife. Within months, Johannes and Elizabeth were married. The only known biography of Johannes Greber was written by a Physicist interested in the paranormal by the name of Werner Schiebeler. 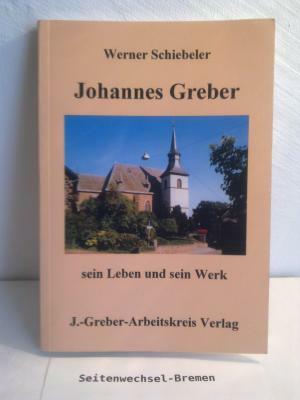 His work, Johannes Greber: sein Leben und sein Werk (Schutterswald: Martin Weber, 1998), a slim, paper-back volume of 182 pages, provides the interested reader with more information about the life and work of Johannes Greber. The book is in German only and so English audiences are, unfortunately, shut out for the time being (unless, of course, one is able in German). The book also provides photographs of Greber as a very young seminarian in Trier, an informal pose of Greber with five other people in 1925 (p. 49), posing outside of his house in Teaneck, New Jersey (p. 67), his two children as youngsters dressed in little childhood, dark-blue sailor suits with white trim and as teenagers posing with their mother, Elizabeth, on the steps of their home in Teaneck (p. 60), and other photographs of Greber's church in Germany, the little boys used as deep-trance speaking mediums for speaking with Greber (photographed as adults), among other photos. Many of these photos are found on this webpage (see above). The Johannes Greber Memorial Foundation was established in Teaneck and operated out of Greber's house under the management of Fred Haffner during the 1950s, 60s, 70s, and early 80s. The Foundation was responsible for the printing and sale of Greber's book and New Testament translation. Over the decades the book went through seven printings in English, and appeared in German, French, and other languages; the seventh edition of which was a gold, paperback, printed in 1987. For decades, Haffner dutifully mailed out the books. "This is your friend Johannes Greber. What I have taught you all these years was the truth. In all that you do (in your life?) put God first." This website, along with the reprinting of Greber's book by Jalan (Amazon.com ), its availability on the Internet along with all of the older editions (some with an inscription by Greber himself), as well as a new, fresh translation of the German second edition made by Joseph Greber and Elsa Lattey that is availabe on this webpage continues in the same Spirit as the Greber Memorial Foundation. May God bless you. This website is meant for those thirsty, inquisitive souls who are digging through the chaos of Christianity for a more meaningful perspective on the Christian message. The impact of the Greber book on my life required me to balance objective, critical scholarship with an intuitive insight that I often prayed came from the guidance of a holy spirit. As all scholarly-trained persons know, skepticism is necessary for one's venture beyond the scientifically established empirical norms that we, as scholars, all work within. But this does not mean a ridicule and an a priori dismissal of that which seems "odd" or "weird," too fantastic to be "real," or too beyond empirical verifications to merit our attention. Instead, we are looking for a discernment, a weighing, an analysis, a judgment of things supra-mundane in order to know something about them. Much of what is discussed on this website may not, in fact, be proof of those things discussed. Rather, it is to show that such things, e.g., communication with God's spirits, reincarnation, pre-existence, the fall of the spirits from heaven, the physical creation as a result of the fall from heaven, etc., are thoroughly biblical concepts that have nowadays become misunderstood or misjudged as non-Christian or "occult," which, to many Christians, means "Satanic." Scientific evidence for the existence of spirits and the afterlife has gradually been building over the past decades. Still, it has not found a niche in the annals of Science yet, for such topics remain stigmatized by the lot of the scientific community and are "quarantined" in the domain of pop-culture. Those trained as scientists, however, have leant their expertise to the fields dealing with the existence of spirits, transcommunication between humans and spirits, and the scientific documentation of a spirit world (an afterlife) with the use of radio equipment, computers, and computer/video imagery. For instance, see the following websites: www.worlditc.org and www.synchronizeduniverse.com. The scientific researches into spirit communication found on the website www.worlditc.org point to the existence of a spirit world. But the spirits who have communicated with the researchers whose findings appear on the website, e.g. Mark Macy and George Meek, don't seem to be holy spirits, i.e. spirits of Christ. The spirits never make any mention of Christ, and God, whom the spirits say does exist, is still some far distant reality for them. These spirits seem to be good-natured people, however, who have nevertheless not advanced very far in their understanding of the higher truths: God's Plan of Salvation for the fallen spirits whom Christ has redeemed by His death on the cross. One should then read the material dealing with electronic communication with spirits simply as research carried out in this field. The only significant purpose for any spirit communication by any human being should be to contact spirits sent on behalf of Christ, the holy spirits that He promised to send us in John 16:12. Communication with God's holy spirits is the only way that we will ever learn what God wants us to know of His Plan of Salvation and the great questions that nag inquisitive minds. "There are two ways to be fooled. One is to believe what isn't true; the other is to refuse to believe what is true" --Soren Kierkegaard (1813-1855). "Ignorance more frequently begets confidence than does knowledge; it is those who know little, and not those who know much, who so positively assert that this or that problem will never be solved by science" --Charles Darwin. "The discovery of truth is prevented more effectively . . . by preconceived opinion, by prejudice" --Arthur Schopenhauer (1788-1860). "Don't believe, find out." --Mark Twain (Samuel Clemens). "Men prefer to believe what they prefer to be true" --Francis Bacon (1561-1626).